This graphic and animation show the internal structure of Jupiter's moon Io as revealed by data from NASA's Galileo spacecraft. The low-density crust about 30 to 50 kilometers (20 to 30 miles) thick is shown in gray in the cross-section. The newly discovered subsurface molten or partially molten magma "ocean" -- also known as the asthenosphere -- is shown in red-brown beneath the crust. This global magma layer is believed to be more than 50 kilometers (30 miles) thick, with the outer part making up at least 10 percent of the entire mantle by volume. The mantle has been colored gold in this graphic. Io is bathed in magnetic field lines (shown in blue) that connect the north polar region of Jupiter to the planet's south polar region. As Jupiter rotates, the magnetic field lines draping around Io strengthen and weaken. Because Io's magma ocean has a high electrical conductivity, it deflects the varying magnetic field, shielding the inside of the moon from magnetic disturbances. The magnetic field inside of Io maintains a vertical orientation, even as the magnetic field outside of Io dances around. 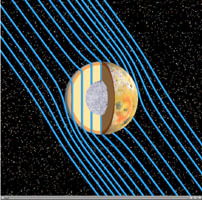 These variations in the external magnetic field signatures enabled scientists to understand the moon's internal structure. In the animation, the magnetic field lines move with Jupiter's rotation period of about 13 hours in Io's rest frame. Io's mantle is made of "ultramafic" rocks, a class of rocks rich in iron and magnesium silicates, which become capable of carrying substantial electrical current when melted. Ultramafic rocks are igneous in origin -- that is, formed through the cooling of magma. On Earth, they are believed to derive from the mantle. Io's ultramafic mantle must have a temperature exceeding 1,200 degrees Celsius (2,200 degrees Fahrenheit) to support rock melting in the asthenosphere. Io's core, about 600 to 900 kilometers (400 to 600 miles) in radius is composed of iron and iron sulfide and shown in a metallic silver hue. The Galileo mission was managed by JPL, a division of the California Institute of Technology in Pasadena, for NASA. Additional information about the Galileo mission and its discoveries is available online at: http://solarsystem.nasa.gov/galileo and http://www.jpl.nasa.gov/galileo-legacy.